Charles (Carlo) Edward Perugini was born in Naples on 1st September, 1839. He spent his childhood in England and took English nationality, but returned to Italy to study art under Giuseppe Bonolis and Giuseppe Mancinelli. He then moved onto Paris where he worked under Ary Scheffer. 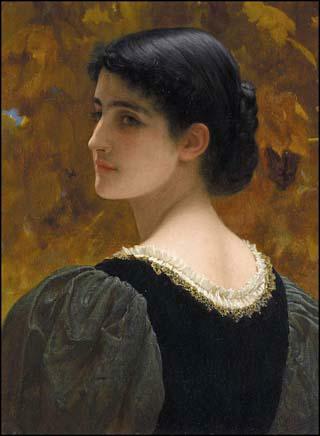 Perugini met Frederic Leighton while he was in Europe. As Lucinda Hawksley has pointed out: "He (Perugini) in Rome and, again, in Paris. There the great artist had employed the attractive young man as a model on more than one occasion and encouraged him with his own work. Eventually, Leighton persuaded him that it was time to return to England and put into practice everything he had absorbed during his years abroad... It is recorded in Leighton's financial accounts that he made regular payments to Carlo over the next few years. There is no record of what the payments were for, but they were most probably for work as a studio assistant and possibly as a model." 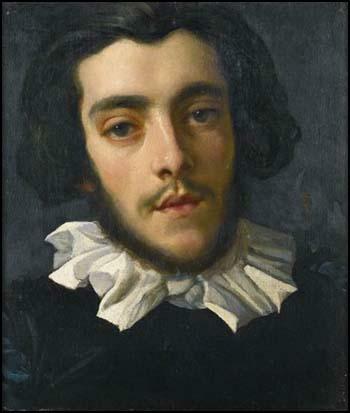 Leighton wrote to his mother: "Carlo Perugini, whom I saw today... is a charming boy, most gentlemanlike, and his that peculiar childlike simplicity which belongs to none but Italians." In 1860 Perugini joined the Artists' Rifle Corp. At first the regiment largely consisted of painters, sculptors, engravers, musicians, architects and actors. 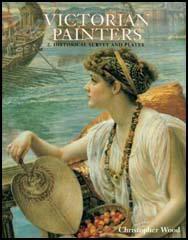 Its first commanders were the painters Henry Wyndham Phillips and Frederic Leighton. Over the next few years several outstanding artists who joined the regiment including William Morris, Ford Madox Brown, Luke Fildes, Valentine Princep, Charles Keene, John Leech, John Everett Millais, George Frederic Watts, Algernon Charles Swinburne, John William Waterhouse, Alfred Leete, Edward Burne-Jones, William Holman Hunt, William Frederick Yeames and Dante Gabriel Rossetti. Lucinda Hawksley has argued: "He (Charles Edward Perugini) signed up in 1860 and served for twelve years. There are also a couple of remaining letters, sent to a less than eager member of the corps, in which Carlo gently but firmly reminds him that his presence is required at the next drill session. It is apparent that he took his duties very seriously, unlike the many who were only interested in the social life. It is no coincidence that Leighton was a very early member of the regiment that was to become renowned for holding the best and most lavish parties." In 1863 Perugini exhibited his first painting at the Royal Academy. He had difficulty selling his early paintings but survived on payments he received from Frederic Leighton, who did what he could to help struggling artists like Perugini and Valentine Princep . It is not known when Perugini fell in love with Kate Macready Dickens. However, it is believed that it was while she was married to the artist, Charles Allston Collins. He died on 9th April 1873, aged forty-five, from a cancerous tumour in the stomach. They married in secret at a registry office on 11th September 1873. The witnesses, Henry Thomas Mitcham and Ernest Edward Earle, were strangers and friends and family did not attend the service. However, they did not live together after the wedding. 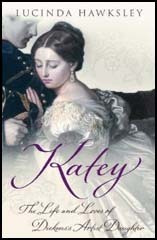 It is assumed that the reason for this secret marriage was because Kate thought she was pregnant. The official wedding of Carlo and Kate took place on 4th June 1874 at St. Paul's Church in Wilton Place, Knightsbridge. The only guests were Georgina Hogarth, Mamie Dickens, Francis Jeffrey Dickens, Henry Fielding Dickens and John Everett Millais . Kate's mother, Catherine Dickens, was not invited because of her conflict with her sister, Georgina. John Forster gave them a wedding gift of £150 and John Everett Millais offered to paint Kate's portrait as a wedding present. However, it took six years to finish. Kate gave birth to a son, Leonard Dickens Perugini on 28th December, 1875. Aged 36, she had a very difficult pregnancy and suffered greatly in childbirth. Georgina Hogarth described the child as being alert, intelligent and happy and predicted that he would grow up to be a genius, like his grandfather. "I am always thinking how proud and pleased her father would have been - and how delighted (we are) with Katey's little boy." In July 1876 the baby became suddenly violently ill. He began vomiting and suffered from constant diarrhoea. The doctor diagnosed a bowl inflammation but he was unable to help and he died two days later. Georgina wrote: Her love for the child was a revelation to herself, of a power of loving she did not know she had in her.... He was a fine, noble engaging creature - with the sweetest nature - so patient in his suffering! I think he was one of those children who are not meant to live." Perugini painted a large number of portraits of Kate Dickens Perugini, including A Labour of Love, Kate, Doubt (also featuring Mamie Dickens) and Kate Perugini. The author of Katey: The Life and Loves of Dickens's Artist Daughter (2006): "After their marriage, Carlo painted Kate regularly, but frustratingly few of the pictures are dated. In the year of their official marriage he exhibited a portrait of her, entitled A Labour of Love, at the Royal Academy. She stands beside an arrangement of roses, looking down, her attention absorbed in her task... Carlo also painted a stunning scene entitled Doubt, for which the sitters were Kate and Mamie. Kate sits at a desk, having stopped pensively while writing a letter. Mamie leans over her. Both sisters look exceptionally pretty - with Mamie coming across as far more attractive than she is depicted in other paintings or photographs." Claire Tomalin , the author of Dickens: A Life (2011) has pointed out: "Even the loss of their only child in infancy did not darken their days permanently. They lived a hard-working and sociable life among their artistic and literary friends and, although they never made much money, by the late 1870s Kate had established herself as a painter, and her pictures were accepted by the Royal Academy." Gladys Storey, a friend of the Peruginis, argued: "Although Mr. and Mrs. Perugini enjoyed the friendship of many, it may be said that they lived a somewhat cloistered though happy life, devoting themselves to the art they loved so well." Georgina Hogarth described Perugini as "a most sensible, good, honourable and upright man, and devotedly attached to Kate. She added: "Every one likes him - he is so perfectly unaffected, simple and straightforward... He will be a good and tender guardian for her future life and happiness." She also suggested that Charles Dickens would have liked Perugini: "This blessed change in her existence would have greatly eased and brightened him, I know - and he would have much liked her husband who I know would have appreciated and loved him." Kate Dickens Perugini wrote to George Bernard Shaw, claiming: "He (Charles Edward Perugini) is, as many Italians are, a little formal and conventional in manner, but in manner only; and he is so modest a man that he never forces himself upon any one, indeed I think this same modesty has been much against his getting on in his profession as modesty is a quality which is neither appreciated nor wanted in these days!" Perugini established himself as one of the most important portrait painters of the period. This included Miss Helen Lindsay (1891), the daughter of Coutts Lindsay, founder of the Grosvenor Gallery. 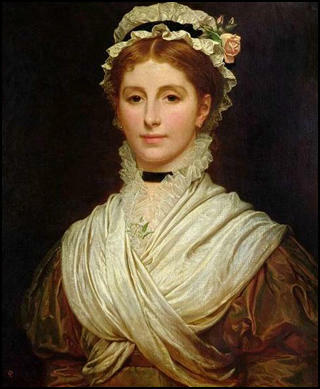 Another important portrait was of Sophy Gray, the sister-in-law of John Everett Millais. He also painted, John Forster, the long-time friend of the Dickens family. During the First World War Perugini's health began to go into decline. He suffered from angina and a problem with his bladder. Kate wrote to a friend: "Carlo who looks all right but is not really well, is afraid of going away for a whole day - for various reasons which you may perhaps understand. If he gets quite better I will let you know but for the present, perhaps it is wiser for him to stay at home." Charles (Carlo) Edward Perugini, aged 79, died at his home on 22nd December 1918. His funeral was held at St. Nicholas's Church in Sevenoaks and was buried in the same grave as his baby son. Charles Collins died of cancer in 1873. The marriage had not been a success and Kate was too sensible to pretend to grieve for long. She was working hard at her painting, she had several admirers, and within six months of his death she married another fellow artist, Carlo Perugini, with whom she was happy. Even the loss of their only child in infancy did not darken their days permanently. They lived a hard-working and sociable life among their artistic and literary friends and, although they never made much money, by the late 1870s Katey had established herself as a painter, and her pictures were accepted by the Royal Academy.